A topsy-turvy, nail-biting series of playoff football games has finally narrowed the field to our last two teams. In one corner, a juggernaut of a franchise looking for its fifth league championship in the last 15 seasons and its ninth overall appearance in the big game. In the other corner, a flashy, high-flying team that steamrolled the competition through the playoffs, making its way to its second-ever league championship game and searching for its first title. We’ll leave the analysis of the game to the professionals, but we can certainly give our input based on uniforms and color schemes! This color scheme is underused in North American pro sports, so we’re glad to see it make an appearance on the biggest football stage. Our love stops at the colors themselves, though. The early-2000s rebrand of this Atlanta-based franchise is still quite evident in their current uniform set, with random and unnecessary accent color blocks scattered around the uniform and a robotic-looking bird adorning their helmets. The team’s uniforms of yesteryear have become a nostalgic keepsake for the fan base, but if this team wins it all in their current digs, then we can’t imagine anyone clamoring for them to revert to the retro look. One could argue that their style of play almost resembles the uniforms they wear: flashy and in your face. Maybe that’ll work to their advantage on the field. 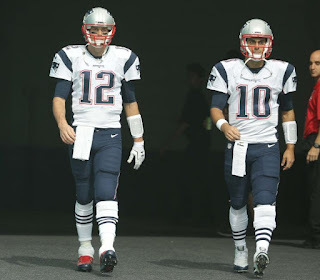 Love them or hate them, the boys from New England are the epitome of consistency in football. They aren’t the epitome of uniform aesthetics, however. Their current uniform, while consistent and unchanged for years, is a blend of the tried-and-true (and tired) navy blue and red with design elements that seem almost like an afterthought. Random color panels on each side of the torso? Check. Blue stripes on blue pants? Check. A shooting star-esque helmet logo? Sure. All that being said, these guys just continue to win. It’s made us soften to their uniforms and most football fans would agree. Their throwback uniforms are still a thing of beauty, though! 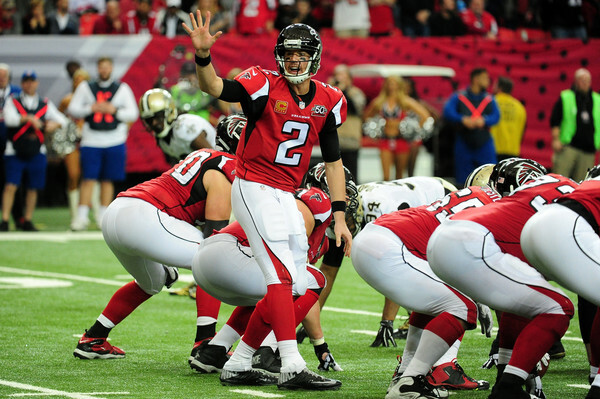 Prediction: We can’t really make a prediction on the field as it’ll come down to controlling turnovers and long, clock-draining drives, but if we had to put our money on a color scheme, red and black has our vote. A long and surprising football season is about to come to an end with an unlikely champion contender facing the veterans who’ve been here before (and before that, and before that). Who do you think will win? Which uniform combination do you prefer? Share in the comments below! 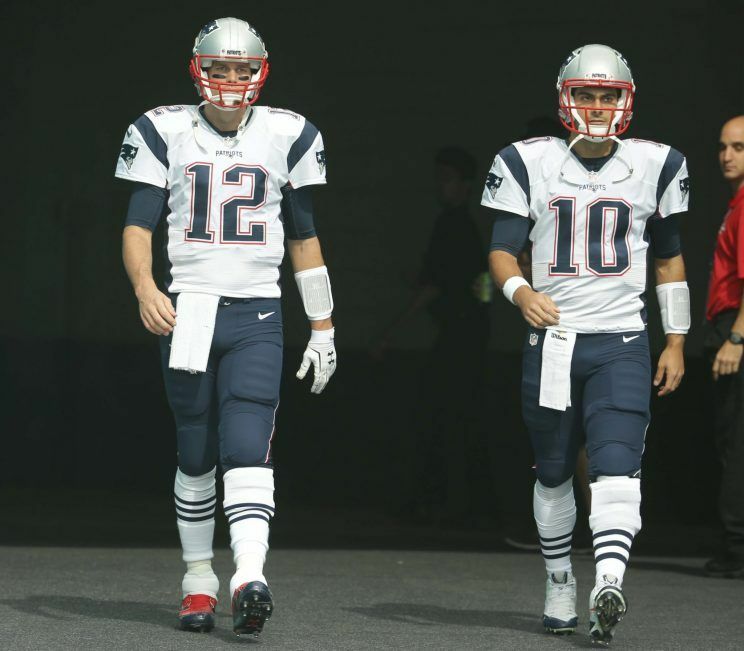 We’ve made it through the first weekend of the playoffs for the NFL, which is usually when the cream rises to the top and weaker teams are weeded out of the tournament. Next week’s divisional rounds are usually some of the most exciting of the season, and this year is no different. We’ll see some of the top defenses taking on well-oiled offenses as well as young, upstart rookies testing their mettle against veterans. 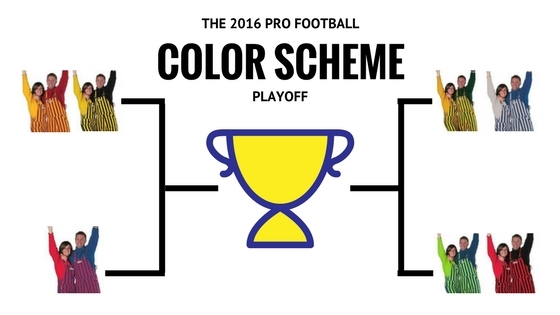 Who will win is anyone’s guess, but we think we know who will win the color scheme matchups! This matchup puts two classic color combinations up against each other. The recently-successful black & yellow versus the iconic red with yellow trim. We’re big fans of celebrating yellow in all its bright, eye-catching glory, so the use of it on the visiting team’s pants has us leaning towards giving them the W. On the other hand, a classic use of red & yellow seems hard to come by these days, with so many teams using weird shades of each color, it’s nice to see someone stick to the classics. Prediction: The away team, in all of their black, white and yellow glory, will be seeing red next weekend. Red & yellow squeaks by with the win, moving on to the conference championship. Well, this won’t provide much variety for viewers at home. That being said, it comes down to uniform execution on this tried and true (and mostly overused) color combination. More often than not in football, you can’t go wrong by matching your helmet to your pants. Both teams have that covered next weekend, with the visiting team wearing navy helmets and pants and the home team wearing silver. That means our judgment has to come down to the jerseys. You can argue both are pretty early 2000s in style and haven’t aged very well, but we like the small touches of red on the uniform of the visitors. Prediction: Football-wise, they probably aren’t likely to win, but the visiting navy blue & red-clad crew has our vote to win purely based on use of their colors. Two classic color combinations will grace the field in Dallas next weekend, with the home team practicing the unconventional tradition of wearing white at home. Doing so gives them an oddly intentional mismatch of shades of blue and silver when you compare their helmet logo to their jerseys and pants, but no one seems to care. On the other side of the ball is one of the cleanest-looking color combinations in sports. This one’s a toughie. Prediction: The green & yellow crew will be too much to handle from a color and performance point of view. They’ll win on the field, and their color scheme has our vote in this matchup. Easily the flashiest matchup of the weekend, this game’s colors are sure to pop off the television screen. On one side is a navy blue & electric green combination, a frequently updated version from the franchise’s original royal blue and kelly green. On the other side is a bright red that contrasts heavily with a black helmet. On the road, this game’s visitors tend to look pretty good, with more of a focus on navy blue than the bright green. That gives them a slight edge in our book. Prediction: While it’s grating on the eyes, we’ve warmed up to electric green. The visitors come away with a win in this one, setting up a showdown between new age and classic the following week. So there you have it, our infallible analysis of who will move past the divisional rounds based purely on their color scheme. Who do you have moving on to the conference championships? Let us know in the comments!